COMBINE the biscuit crumbs, ground hazelnuts and butter then press into the base of a greased and base lined 22cm round spring form pan. Chill. BEAT the PHILLY and sugar with an electric mixer until combined. Stir in the gelatine. Divide mixture in half and stir the dark chocolate into one half, and the white chocolate and vanilla into the other. Fold half of the cream through each. SPOON the dark choc mixture into the prepared base then carefully spoon the white layer over the top then sprinkle over the raspberries. Refrigerate for 3 hours or until set. 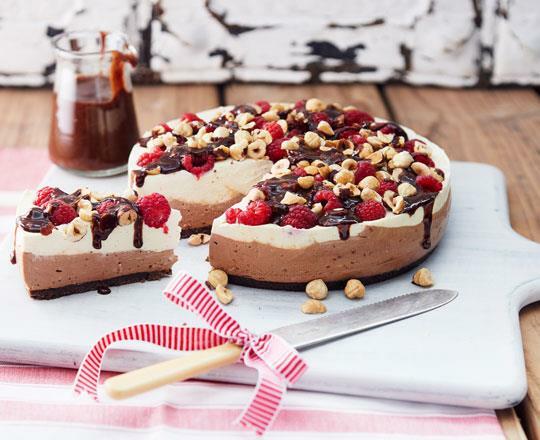 SPRINKLE the hazelnuts over the cheesecake and drizzle with the chocolate sauce. Serve immediately.